The games are over and the nets have been cut down. As the NCAA crowns their new champion, the University of Connecticut Huskies, we are Sweatshirt Blanket are pleased to announce that Save the Children is the winner of our Spread Your Warmth March Madness Tournament. For their win in our tournament Save the Children will receive twenty custom sweatshirt blankets for use at their discretion. 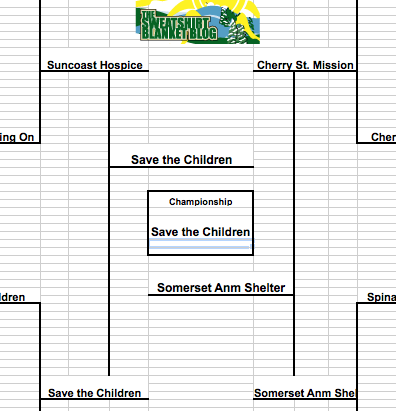 Additionally, congratulations are in order to Somerset Animal Shelter for outlasting 62 other very deserving charities to take home second place. They will receive ten custom sweatshirt blankets for use at their discretion. Finally, thank you to all of you followed along during the tournament, nominated your favorite charities for the Spread Your Warmth campaign and regularly voted in our monthly contests. We sincerely appreciate it. It is the goal of all parents so that your baby safe and comfortable. One of the most valuable tools that every parent, especially a new parent has a baby blanket. This tool can be used to keep warm, keep dry from the rain and play mat is a trust in an unknown place.